Fish is an important element in human nutrition, as it is a great source of protein and other nutritive substances. Selling seafood is easier on Export Portal, as our website provides safe and effective trading. Buy high quality fish and crustaceans from verified sellers and manufacturers from worldwide! Fish, Crustaceans & Aquatic Invertebrates section provides a great assortment of frozen and fresh fish, fish for sushi, smoked fish, fillet and whole fish. Browse our wide range of freshwater and saltwater fish such as trout, whitefish, salmon, Alaska pollock, anchovy, fluke, herring, mackerel, redfish, sardine and tuna. Export Portal is the right place to sell all kinds seafood and the best website for online shopping. Crustaceans, shellfish and molluscs are popular in many types of cuisine. On our website shop prawns, lobsters, clams, mussels, crabs, scallops, oysters, langoustines, crabs, shrimp, crayfish, squids. Other sea products such as caviar, sea cucumbers, sea vegetables, seaweed, fish oil and fish sauce are also available on Export portal. 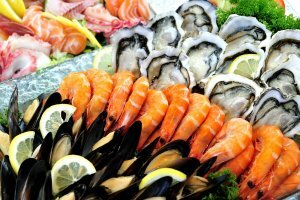 If you are looking for high quality seafood products, you might be interested in shopping from around the world on Export Portal! If you are a seller and you are seeking a tested online marketplace to sell foodstuff - you found it!